Huzzah! The latest issue of my favorite fantasy magazine goes on sale today. Ahem. Favorite other than Black Gate, of course. 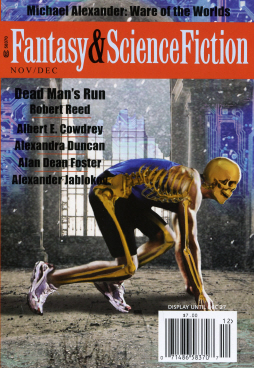 The big November/December double issue of Fantasy & Science Fiction includes contributions from Robert Reed, Alan Dean Foster, Albert E. Cowdrey, Alexander Jablokov, and many more. The Robert Reed story about running in this issue is so effective that I lost 8 pounds and knocked 0:31 off my best mile time just by editing it. Speaking of editing it, it is 100% true that when it was on submission, I read one of the stories in the issue while attending one of my daughter’s tea parties. (I won’t say which story.) Jerry Oltion has bought 5,000 copies of this issue and stored them away, just in case he might need them in the future. Alex Irvine didn’t get the memo that he was supposed to send me a story just so his name could be on the cover. We last covered F&SF with their Oct/Nov issue, with Richard Chwedyk, Michael Swanwick, Terry Bisson, and Richard Matheson. If you missed it, maybe it’s time to consider subscribing? Complete details (and a subscription form) are available on their website.